I am a lover of plants. I come by it naturally, my mom is an excellent gardener and her mother also excelled in loving green things. My grandma even had a "secret garden" inspired by the book which was just as enchanting and charming as you can imagine. She had bleeding hearts and wild, heirloom roses that filled her property with their perfume-like scent. And, because of my mom, I have a cutting of those very same roses in my garden. I'm not as good at it as they are. I have the love and not the talent. Houseplants do better here, and my home is filled with them- which is interesting since both of those women have very black thumbs once the plants come indoors. But they do well here and I love them. Outside I stick with simple things that grow easily and don't require much care. I have scads of roses and lavender and mint, things that come back every year and I never prune them, even if I should. I also have peonies. Six bushes of peonies. My mom grows them and my grandma grew them and I wanted them too, but had no idea what I was doing. I purchased them at the end of summer the year we bought our home and planted them in my bed (with no consideration to sun or location!) in the Fall and eagerly awaited the arrival of Spring so I could cut zillions of them and bring them indoors to swoon over. Spring came, and I saw them starting to come up. It was so exciting! I went out to check on them every day. But... they never produced. The next year was the same story. And the next year again. I was really discouraged by this point and had mentioned it to my dear friend Liz (over at Broken Called to Beauty and you should check her out immediately) who grows scads of peonies at her home many times. I asked my mom. I even asked my brother, who is no gardener at all and has rows of peonies! I couldn't figure out why my peonies weren't producing and it was so frustrating! I was starting to think about moving the six bushes or just giving up on them entirely. 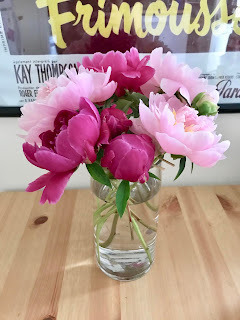 Finally I consulted my friend google, who told me that peonies don't particularly like the location they were in and need plenty of sun, but also... they need plenty of time. If you move a peony or plant a new one, they can take up to four years to produce blooms. I noticed little buds on three of my plants early in the season, but didn't want to become too hopeful since I've seen buds before. They grew and grew. Some of them started to turn black, and I thought it was going to be another unsuccessful year. And then the magic happened! Literally, overnight they started blooming. Today I'm staring at this vase which started with one glorious bloom this morning and now has six, with two more on the way. And it made me think about my life. And dreams. And all the really important things... the desires of my heart. They're so much like these silly peonies and our lives are so much like a garden. It can be so hard to watch and water and wait... and still believe we will see our dreams come to pass. Or believe for the desires of our heart. I know what it means to watch and wait. I know what it means to watch baby after baby fill the arms of happy mothers while mine remain empty. I know what it means to have deep dreams and feel like time is slipping away along with them. But today was a reminder that these dreams, these desires are peonies. They take time. I can't give up... because they very well could bloom overnight! We never know the moment when the waiting will be over. All that time, the peonies weren't idle. They were growing and preparing. No time was wasted. No time IS wasted. So for those you who perhaps, like me, need the reminder... here it is. Psalm 20:4 -May He give you what your heart desires and fulfill your whole purpose. We want to be ready when the water at last comes. Keep doing what you know you're to do. The water will come, the peony will bloom. I'm praying for those of you who are waiting. Praying you will find all of your everything in Him who holds all of our everything. He is so good. And He is enough. And may He bring your garden into bloom.